The Fatima Controversy, of a Vatican conspiracy to hide the real message of Fatima, has been fuelled by Pope Francis’ consecration of the World to Fatima, on October 13th 2013. In his short time as Pope, Francis has made two public consecrations to Our Lady of Fatima (the Virgin Mary). The most recent, on October 13th 2013, the 96th Anniversary of the Miracle of the Sun, fuelled the belief of the Fatima controversy devotees, the Fatima Network, that the message of Fatima has not been fulfilled. The leader of this fringe group, Fr. Gruner, who was in Vatican City, was asked to leave by Vatican security four times whilst distributing propaganda materials. To consecrate is to dedicate an object or person to a specific purpose. In this context, is a commitment to the meaning and message of Fatima. Hours after his election as Pope, Francis made a special request to the Portuguese Cardinal to dedicate his papacy to Our Lady of Fatima. It was performed on May 13th 2013, the date of the Feast of Our Lady of Fatima. The last Pope to make such an act of devotion was John Paul II, who believed that he owed his life to Our Lady of Fatima after his failed assassination attempt on May 13th 1981. John Paul II was also implicated in the Fatima controversy by his public revelation of the final part of the Secret of Fatima. The Message of Fatima is a peace plan delivered by the Virgin Mary to three young shepherd children in Fatima, Portugal in 1917. The peace plan showed premonitions of catastrophic future world events, with instructions of how to avoid them. Originally told as a Secret in three parts, the Message of Fatima was interpreted and revealed by the Vatican on instruction by the Virgin Mary, who continued to deliver messages to Sister Lucia (nee Lucia Dos Santos, the oldest shepherd) throughout her life. It is the interpretation and revelation of the Message of Fatima that has caused the Fatima controversy. Fringe groups of Fatima devotees capitalize on the belief that the Vatican has hidden the real Message of Fatima by holding back parts of the Secret of Fatima, and has not fulfilled the specific instructions defined by the Virgin Mary. Part of the Secret was delivered in the Third Apparition of the Virgin Mary on July 13th 1917. It revealed the end of the First World War but the threat of a second, worse war. To prevent it, the Virgin Mary said that she would return to ask that the Pope consecrate Russia to her, for which reward would be a period of peace in the world. At the time, Russia was embracing Communism and its associated Atheism. The strong warning from the Virgin Mary was that if the consecration was not done, that Communism would spread throughout the world resulting in war, famine, and the persecution of the Church. The Virgin Mary appeared to Lucia in 1929 with the request for the Consecration of Russia to her heart. She returned again in 1939 asking that the dedication should be extended to include ‘all the world’ with a special mention of Russia, and in union with all of the Bishops of the world. This addition to the message adds to the Fatima controversy as not a part of the original message. Four Popes have so far performed consecrations to the Virgin Mary at Fatima. However, it was not until John Paul II’s third attempt in 1984 that the dedication was confirmed by Sister Lucia as accomplished. Pope Pius XII consecrated the world to Our Lady of Fatima. Pope Paul VI renews the consecration of Russia in the presence of, but without the participation of the Vatican council. Pope John Paul II invites the Bishops of the world to consecrate the world and Russia, but many did not receive the instruction in time. Lucia confirmed that the consecration did not fulfill the conditions. Pope John Paul II renews the consecration at the Synod of Bishops. Pope John Paul II, in union with the Bishops of the world, consecrates the whole world to Fatima. On August 29th 1989, Lucia confirmed by letter that the consecration had been accomplished and that “God would keep his word”. 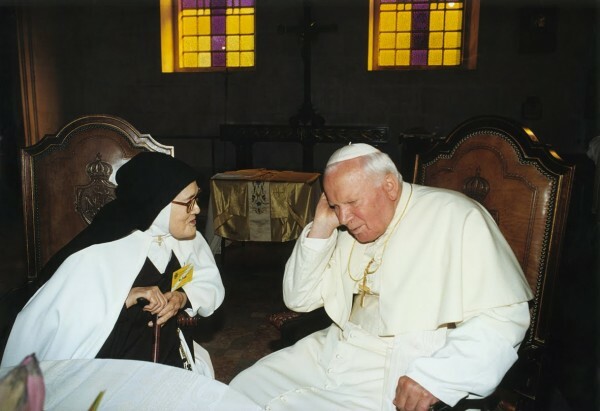 Sister Lucia became a close associate of Pope John Paul II as he dedicated his papacy to Fatima. On March 11th 1985, Mikhail Gorbachev was elected as the Soviet Chairman. On November 9th 1989, the Berlin Wall fell. On December 25th 1991 the Union of Soviet Social Republics was dissolved. Fatima Controversy: Consecration or Conspiracy? Do you believe that the consecration was achieved? Or, do you believe in the Fatima controversy of a conspiracy to hide the real meaning of the message of Fatima? The Fatima Controversy theorists say that the consecration has not been performed correctly, and base their arguments on the fact that we are not yet enjoying a period of peace, and Russia has yet to be converted. Those that believe the consecration has been achieved base their acceptance on the fact that Sister Lucia made a personal confirmation by correspondence to the Pope. Join in the debate, leave a comment, like or share this page …….